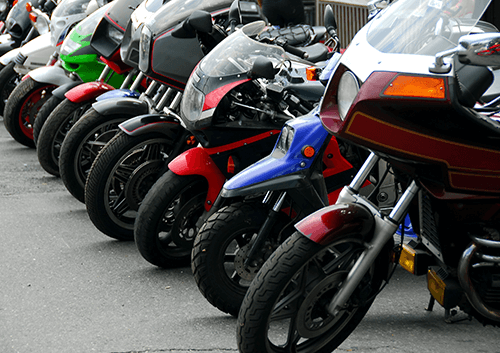 Moto Morini is a name that’s rarely uttered within motorcycle communities. However, that is clearly not reflective of its pedigree as a stellar motorcycle manufacturer. Moto Morini is the archetypical phoenix, having risen from the ashes more than a few times. With every rebirth, the manufacturer manages to create something special. Its more recent offering is the stunning Corsaro 1200 ZZ. 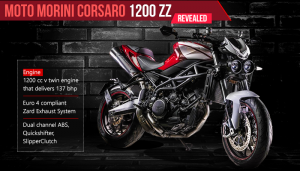 The Basics Now, the Corsaro 1200 ZZ may be Moto Morini's latest experiment, but it retains the "fearless and furious soul" that Moto Morini's previous products have been known for. It's made in Italy, and when we say made in Italy, we mean "99.99% Made in Italy". The other. 01% is German and manifests itself in the form of the Bosch ABS Module. Everything else is Italian – the radial monoblock calipers from Brembo, the 5-inch TFT colour display, the fully adjustable forks in the front, the Zard full system exhaust, and the Pirelli tyres. The Corsaro has been lauded for its build quality. The engine and gearbox are solid. Of course, there has been some concern over the availability of spares. 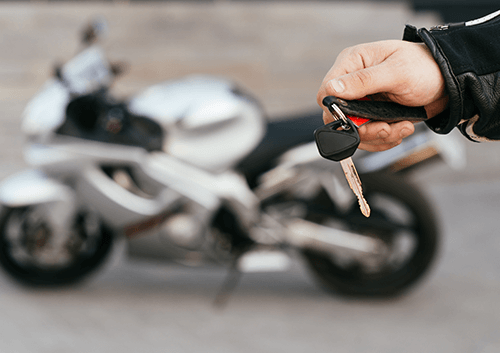 However, Moto Morini has addressed that with an exclusive importer in the UK and a wide dealership network. Engine The Corsaro 1200 ZZ is powered by an Euro4 spec 1187-cc v-twin engine that puts out 137 bhp. It’s significantly smoother than its earlier iterations from the 2000s. For starters, you get a quick-shifter and a slipper clutch, which are fresh additions. However, you still don't get traction control, multiple ride modes, or an autobliper. Power peaks at around 8500rpm, which makes the Corsaro a bit sluggish at lower revs. However, at 6250rpm, you get about 92ft-lb of torque. As you might have realized by now, the Corsaro is all about grunt. The gears are practically useless once you hit the sixth. Vibrations are almost non-existent, and the bass from the engine is a delight. This is quite surprising considering the fact that it's coming from an Euro4 spec motor. The Corsaro is all about raw, simple power and performance. It’s mostly analogue and handles like a typical super-naked, which means it’s light and nervy. You can expect plenty of wheelies on this one. 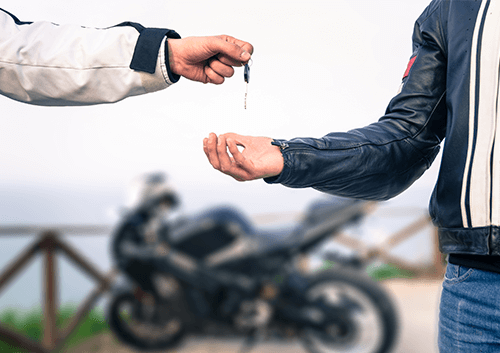 However, that also means you need to ride with care and avoid crossing its intrinsic limits. The Pirelli Diablo Rosso II will enter “spin mode” if you try to push the machine too far. Cost and Equipment The Corsaro just costs a few thousands more than its closest rival, the Aprilia Tuono V4 1100 Factory, which is the class leader. Of course, that still doesn’t make it an affordable motorcycle. However, what the Corsaro does offer for the price is the exclusivity of a hand-made Italian stallion. 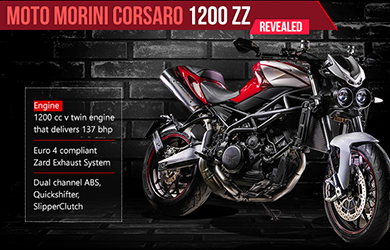 As for equipment, the Corsaro 1200 ZZ comes with ABS as standard, full-adjustable Mupo suspension at the front and back, LED headlights, M50 Brembo monobloc calipers, Accossato bars, Brembo brake, and clutch master cylinders, and revised steering geometry, etc.